Unlike the SS Siberia 800, its successor is almost $100 more expensive; However, it can connect through Bluetooth with smartphones, and has vast audio customizations accessible through the SteelSeries Engine 3 software. First and foremost, this model offers excellent sensations of comfort. The consequential deployment of the hoop is responsible for the aptitude of being suitable for heads of different morphologies. The weight and the pressure points are well distributed to sit naturally on your head and be comfortable for long plays; the large perfectly round earcups enveloped in leatherette pads cover your whole ears, the contact with them is pleasant to touch. In addition to that, the earcups swivel so you can rest your headphones vertically. Closely related to ergonomics, the Siberia 840 offers a good amount of passive isolation that diminishes the surrounding noise. In the matter of wireless gaming headsets, the second most critical aspect is Bluetooth latency which in Siberia 840s case is less than 15ms – this low value provides an unerring wireless communication with no delay. One would hardly perceive a slight shift in sound given the low latency in transmission, but the problems would only occur when multiple Bluetooth devices are connected to the same network. Regarding autonomy, 15 hours of use are promised by the manufacturer. The headset fulfills its promises perfectly. Moreover, you can double the amount by swapping the batteries with a fully charged battery. There won’t be many cases of playing 30 hours straight, even so – if you don’t overuse decibels, can even enjoy a few extra hours. The Siberia 840 opts for a small sound signature in W, with an emphasis on certain frequencies in the bass range and treble. Equipped with large 50mm speakers, SteelSeries aptly demonstrate their competence in the gaming field. A lot of important elements that are part of the gameplay (steps of enemies, bullets, high-pitched sounds from missile, etc.) are easily perceptible and reproduced with high fidelity by this pair of high-performance wireless gaming headset, which isn’t a small advancement on the subject of wireless connection. The audio profile is highly configured for such instances – Better so, you can further configure it with the use of SteelSeries Engine 3 – an indispensable software for changing any gaming related attribute from SteelSeries gears, from Siberia 840s sound profile to the sensitivity and illumination of a gaming mouse. There are 2 primary attributes which define the identity of Mobius: The first is to have been designed as a hybrid headset ; certainly above all thought for the practice of video games, it is also usable without any constraints like a mobile headset … and even wireless, since it has a Bluetooth receiver. But its most notable feature is to embark on a very ambitious 3D sound virtualization system, benefiting from Waves Nx head motion tracking technology. Audeze did not get complicated with the design of its new gaming headset appearance – Mobius. The company went for a minimalistic look and dismissed all the aesthetic flourishes that are usually encountered in ordinary headphones for gaming. There are no colored LEDs or weird shapes or angulations. The headphones embrace a classic yet stylish look with fine lines and discreet blue/copper earcups, no multicolored lights or aggressive shapes here. 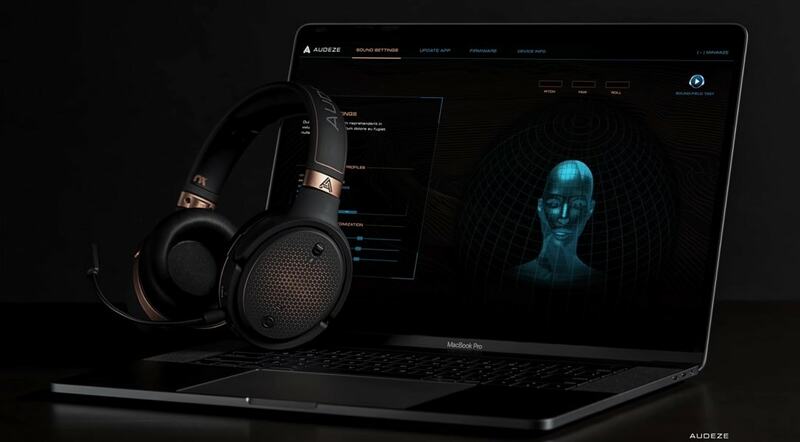 Audeze ingrained Waves Nx technology into Mobius, a technology often used in VR headsets, which turned them into a high-end 360° surround sound system able to offer head tracking functionality and genuine spatial sound. In the end, Auzede Mobius is a cut above any gaming headset with immersive sound, being one of the most versatile and sophisticated unit that embody real-life experiences from the virtual world. It doesn’t take long to realize the majesty of Audeze Mobius sound once donning them on your ears. As one of the best gaming headset, the audio quality is the second most intriguing aspect after the immersive soundscape generated by the planar magnetic drivers and Waves Nx technology for 3D audio immersiveness. Not only does the 100mm planar magnetic drivers emulate the most authentic immersive cinematic experiences, they also achieve an admirable level of precision and responsiveness. The complexity of the captivating, imacculate surround sound with the dramatic and vivid sounds filled with details make it almost impossible to take them off your head. The experience is truly addictive. Sound restitution exhibits with precision, clarity and richness. We know Mobius is branded as a gaming headset, but they could seamlessly fit as headphones for TV or monitoring headphones due to its extraordinary Hi-Fi sound and immersive soundscape. With a rather “W” sound signature, the music is warm and balanced along the lows with a slightly accentuated bass followed by a dip in the range of presence, more precisely around 5 kHz, with a huge rebound at the mark of 6 kHz. On treble, it follows a similar structure as the presence; A small dip around 15 kHz and high upward curve all the way to the end of the spectrum (20 kHz). In the end, it’s highly unlikely, especially as a gamer, not to enjoy a top quality Hi-Fi gaming headset designed by Audeze whose vision was shaped by the needs of pro players to create a competitive wireless gaming headset. Immerse yourself completely into the game with Audeze Mobius gaming headphones! The Carus GXT 322 (launched at ~ $40) is Trust’s most cost-effective wired gaming headset. The headphones guarantee the best value for as less money as possible. The successor of the GXT 313 NERO and bigger brother of the GXT 330 XL Endurance. GXT 322 is packed with all the required features expected on pair of affordable gaming headset. Design-wise, materials, comfort, and sound quality we think the Carus GXT 322 has earned its spot on this list among the best gaming headsets of 2019. As low-end headsets, the GXT 322s doesn’t have accurate sound rendering, but you surely can expect a good chunk of deep bass, clarity, and stereophony intelligibility. Technically speaking, the overall sound spectrum is rather recessed with just a slight uplift on the lower range of lows (the sub bass frequencies), which is responsible for small touches of sound depth and a sense of powerful tones, this elevation on the spectrum only resume in the entire range of presence. Lastly, the boost ends in the middle section of brilliance back beneath the median level of the audio spectrum. The high-pitched sounds will be almost inaudible on low volume. Nonetheless, there’s a nice feeling of immersion caused by the slight reinforcement of the deep bass and are sufficiently increased so far not to sound too harsh overall. There’s a lot of benefit to sounds of gameplays with Carus GXT322s W sound signature, particularly voices. The microphone is a nice addition, and usually a necessity for gaming. GTX 322’s microphone is fully flexible, of good quality, but cannot be removed and does not retrace. It has a particularly useful windshield which acts as a passive noise filter, but nothing more. Apart from the fact that it manages to record voices clearly and send an intelligible message across, there’s nothing to mention about them. Aside from the first gaming headsets produced by Audio Technica which are currently discontinued (ATH-AG1 and ADG1), this time the Japanese company approaches the gaming industry one more time with another ambitious gear – ATH-PDG1, a comfortable, airy, open-back headset with a flawless sound reproduction made for audiophiles. Let’s cut short the suspense – The Audio Technica premium gaming headset seduces us not only by the very polished and professional design which set them apart from the typical appearance of most headsets designed for gaming but also by their flattering audio profile, with no distortions, inaccuracy or masking effect. The Audio Technica ATH-PDG1s gaming headphones launched with a price of no more than $200 – more precisely $190. Currently, they are sold for approximately $130; Although they aren’t as pricey as they used to be, their value is still the same, which for the consumer might seem as great opportunity to dominate on the battlefield with a bigger audio edge than his foes. I’m happy to acknowledge the sound performance of ATH-PDG1s being as finessed as the sleek design of theirs. The sound reproduction is notable of audiophile ears. The company’s expertise of over 57 years is imbued into the musical reproduction of this wired gaming headset, the sound is reproduced with accuracy and the tones and notes are crystal clear. Enough of the extravagant audio experiences derive from the 50mm drivers. A lot of this pleasant outcome also come from the emphasis put on the upper-end of the spectrum, where the brilliance and mid-range dazzle; Aside from that, the bass is easily identifiable as well. What is rather unlikely, is the lack of presence, thus feeling the absence and lack of projections of the high-pitched vocals and few oher instruments established in that frequency range, in this case: 3 kHz and 5 kHz. HyperX has been a leader in the consumer audio sector for years, so it’s not astonishing to see that their Cloud Alpha gaming headsets have earned a spot in our list. With the multitude of features and technology that revolve around the needs of most gamers, this headset reigns in the world of gaming being the dream of almost every players. For its incredibly high value offered in exchange for a bearable price, the headsets are highly accessible for a price of little under $100, thus making the HyperX Cloud Alpha become the benchmark for affordable gaming headsets. When it comes to its satisfactory assembly, The Cloud Alpha’s constitution slightly differs from their almost namesakes in a few areas, one not so visible detail is the hoop which is broader and more spacious to better adjust to large heads. The remaining elements are still the same. The HyperX Cloud Alpha gaming headsets are well made from aluminum and high-quality plastic in moderate quantity, the frame of the arch and the forks are made of aluminum, the same with the back of the ear cups, which conveys satisfactory robustness. The hoop and the pads are covered with leatherette extremely soft to the touch, which contributes significantly to the excellent comfort of HyperX’s Cloud Alpha. The other key element is the thickness of the memory foam padding, which has been revised very considerably, both at the level of the skull and the ears, compared to the previous Clouds. The pads are removable, however, HyperX does not provide additional earpads – only the pair of imitation leather is included in the box. Let’s cut the chase and say it without embellishment: without the slightest possible challenge, the Cloud Alpha is worthy of its ambitions. For this model, the headsets use 50 mm drivers with a frequency response between 13 Hz and 27 kHz. The Cloud Alpha gaming headsets offer a homogeneous and pleasant audio reproduction, but which still has a few flaws in the presence range of the spectrum. From the beginning, we find exemplary linearity that ends in the middle of the spectrum. Aside from the poor reproducing of the sounds in the lower end of bass (below 30 Hz), the Alpha Cloud masters its subject to perfection in this frequency region. The low and midrange are reproduced with excellent clarity, without ever the slightest overflow regardless of the complexity of the sound signal. The bass naturally finds its place and are reproduced faithfully, even if they lack clarity and punch. The voices are clear and precise, to easily hear teammates. There is a boost in the high mids/highs, which brings brilliance and a bit of lift to the whole, without exacerbating the sibilance of the voice. The microphone is a necessary addition for any player that carries significant utility into the game. The recording is not spectacular, but good enough. It covers a wide spectrum sufficiently to reproduce an accurate and intelligible voice. Although it’s sensitivity is quite low and the windshield isn’t very effective, the microphone is flexible and one can manage to remove it. The methodology of buying a gaming headset in 2019 hasn’t changed dramatically compared to the previous years. Maybe you are used to the regular headsets and prefer stick with those, but quite a lot of new headphones enriched with captivating, innovative features appeared since 2018, which will become as common as the wired headphones in the forthcoming time. Before you make any buying decision, it’s good to consider different aspects to take into account when you do your research. The first thing you must pay attention is the platform you use for gaming. Certain gaming headsets compatible with PC won’t work on Mac, PS4 or Xbox One. If you consider yourself a PC gamer enthusiast, ensure the headsets you buy are compatible with your system. Conversely, if you prefer the consoles, check if your headsets are compatible with such devices. Wireless gaming headsets obviously do not have the burden of having wires, thus offering a much comfortable use. They do not bring benefits, however, since they will need to be recharged regularly and their price is often higher. Photive has a variety of wireless headphones and bluetooth earbuds so we tried to rank them to find which headphone is the best within its category by researching and analyzing the ratings of other people’s opionions and by manual testing. Ultimately, after aquiring enough data about every headphone we’ve concluded that among Photive earbuds, the #1 spot was earned by Photive BTE-70. Have you wondered which type of over-the-ear headphone would suit you better? There are 2 over-ear headphones designs. Both are different in terms of listening experience and utility; Closed-back headphones and Open-back headphones. However, the nuisance of allowing ambient sounds and noises enter your ears may alter your listening experience. If that’s not the case for you, the Semi-sealed headphone designs will provide a much comfortable and unique experience – Semi-sealed headphone designs allow for less weight and don’t enclose the air. The other type of headphones, the ones with closed-back design are subject to more vivid and nuanced bass due to the sealed air cavity around your ears. It’s a common sensation to feel a large musical ensemble inside your head within a small spread – the enclosure of closed back headphones shape the sound to appear more as the music would play in your head just as an orchestra. This choice will depend on the game you play, so it is essential to choose the audio system of your headphones wisely. Stereo – Stereo headphones have only 2 channels (right and left). For less demanding games where the 3d experience is not crucial, you can go on a stereo system. You do not need an ultra-worked sound or have extremely developed bass, and you will have a balanced sound that will do the “work” and especially at a reasonable price. For games requiring high precision, you can then go to a 5.1 surround system; Highly appreciated by gamers, it offers a compelling rendering. You can go even further: a 7.1 system will bring you even greater precision: a step behind you, a broken branch, you will hear everything. Headphones with Dolby surround 7.1 are the ultimate sound system for gamers, essential for MMO and FPS players. Aside from the very common 3.5mm connector, there are a few other type of connectors some headsets use to connect to the gaming system.